James Kenney Recreation Center, 1720 8th Street, Berkeley. 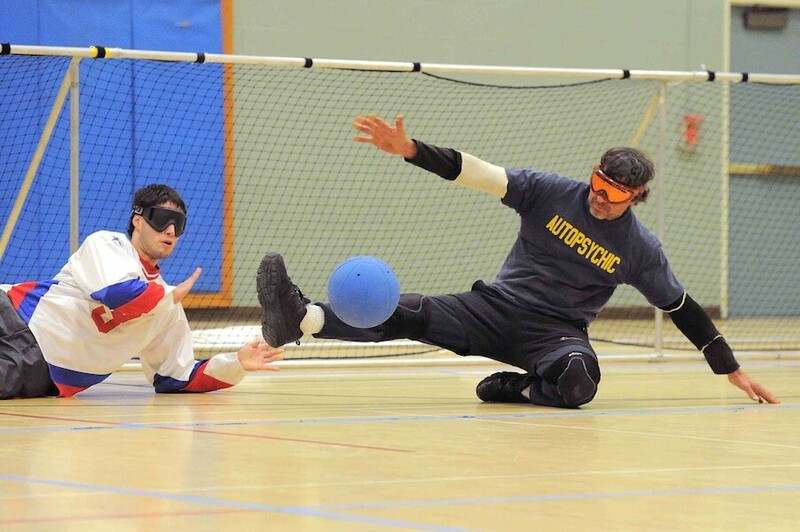 Seven teams will compete for the title in the longest running goalball tournament on the West Coast. The Sacramento River Bats led by USA Team player Joe Hamilton and coached by USA Assistant Coach Matt Boyle return to defend their title against a loaded field including many Paralympians past, present (and future). 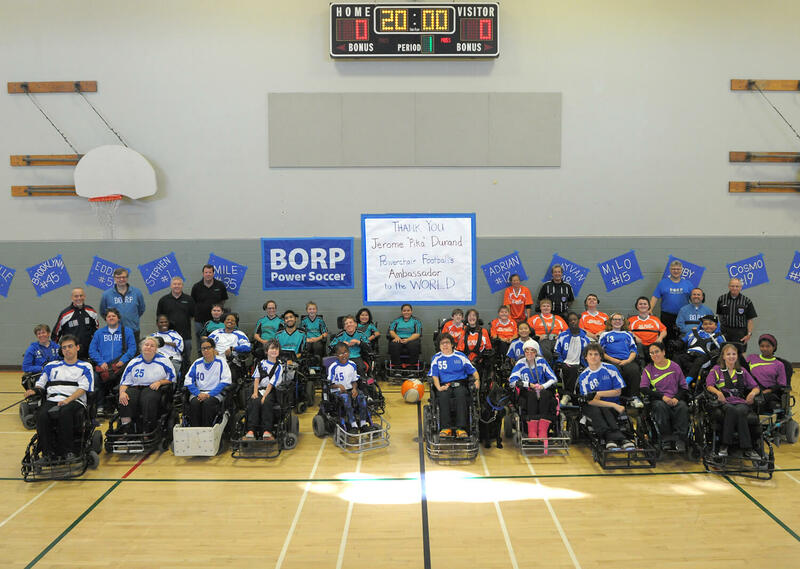 BORP Power Soccer kicked off the home season with some glorious competition at James Kenney Recreation Center on November 15-16. All three of BORP’s teams were in action and all three put together awesome and spirited play against rival teams from around Northern California. The weekend of play was dedicated to the memory of Jerome “Pika” Durand who passed away on November 13. Pika was a long time international player and coach whose dedication to the development of the sport was instrumental in its global growth. The BORP Shockers got Saturday started with a very efficient 3-1 win over the Kryptonite Pride (Hayward). In their second game of the day the Shockers came up against the newest team in the area, the Sac Valley Flames. The Flames showed that they will be a force to be reckoned with as they stymied repeated offensive forays of the Shockers throughout the game and forced a 0-0 tie. The Shockers attack got back in gear for their 3rd game of the day as they rolled to a 3-0 victory over the San Jose Rockets. The scoring output for the Shockers was spearheaded by the combination of Ian Kinmont (5 goals) with 4 assists (and 1 goal) from Ruby Shemaria. April Bryant also chipped in a nifty assist and Margaret Mele contributed strong play in goal. The BORP Bombers day started with a tough first half versus the SJ Rockets and a 4 goal halftime deficit. Coach Fuller rallied the troops at halftime and a toughened defense relinquished only one goal in the second half and a 5-0 final score. While the Bombers had no goals their aggressive philosophy created several nice chances and only brilliant work in goal by the SJ keeper kept the Bombers out of the scoring column. The Bombers 2nd game against the Pride showed a reversal of halves but unfortunately a similar result (6-0). The Bombers were down only 1-0 at half but some unlucky bounces and mid-day blahs contributed to the Pride’s strong finish. Game 3 pitted the Bombers against the Flames and was a whole different story. The Bombers took a 1-0 halftime lead and after a Flame equalizer the Bombers went up 2-1 with 4 minutes left in the 2nd half. Sadly relentless pressure from the Flames resulted in 2 late goals and a 3-2 win for the Flames. Emile Perry scored both Bombers goals and Stephen Dykstra was a mainstay on the attack and on defense throughout the day. Despite the final results the Bombers showed they are on track for an exciting, productive season. The BORP Crushers got into action on Sunday against the powerful San Jose Steamrollers. An end-to-end battle to the end, Jake Bath scored an opportunistic goal late for the Crushers to secure a tense 1-0 victory. In game 2, the Crushers faced the Hollister Free Wheelers and put on a beautiful display of passing and execution and were up 4-0 at halftime. The offensive contributions came from every player and were highlighted by a thread the needle assist by Cosmo Rudd to Milo Balcziunas for a deft finish. Other sweet goals came off the guards of Calum Cain (2 goals, 1 assist), and Stanley Kuang (1 goal, 1 assist). To Hollister’s great credit they came out with a vengeance in the 2nd half and scored 2 goals and created several opportunities for more. In the end the rotation of goalies John Madigan, Milo Balcziunas and Jake Bath was equal to the task and kept the Free Wheelers at bay to secure the 4-2 win. Of special note: BORP Bomber Stephen Dykstra is an Assistant Coach for the Sac Valley Flames and his long term experience and knowledge of the game is clearly benefiting the Flames. Way to Go, Stephen! OMG: Thank you to the BORP families for the wonderful lunch and refreshments for the weekend! BORP is blessed beyond words to have the support of such a dedicated, generous group of people. Thanks to referees: Dan Chafey, Bill Cain, Paul Navazio, David Edward, Rich Dykstra and Luke Smith. Thanks to volunteers: Milan Scott, Evan Robertson, Megan Gray, Meredith Haggerty, Dan Fernandez, Ian Crowne, Luke Smith, Jenna Brennan and Matthew Du. Thanks to photographers: Joe Carrow and Scot Goodman (gallery links soon). Next home games for the Bombers and Shockers will be on Dec. 13. Hope to see you there. The Subaru “Share the Love” Event is a national promotion that will run from Nov. 20, 2014 to Jan. 2, 2015. Subaru of America will donate $250 to one of five charities of the customer’s choosing for every new Subaru vehicle sold or leased during that period. BORP is the official (and only) local charity selected by Albany Subaru to participate. When BORP is selected by a customer as the designated charity, Albany Subaru will supplement an additional $100 donation, for a total of $350 per Subaru sold going to BORP! Albany Subaru’s goal is to sell or lease 50-60 cars with BORP named as the beneficiary. 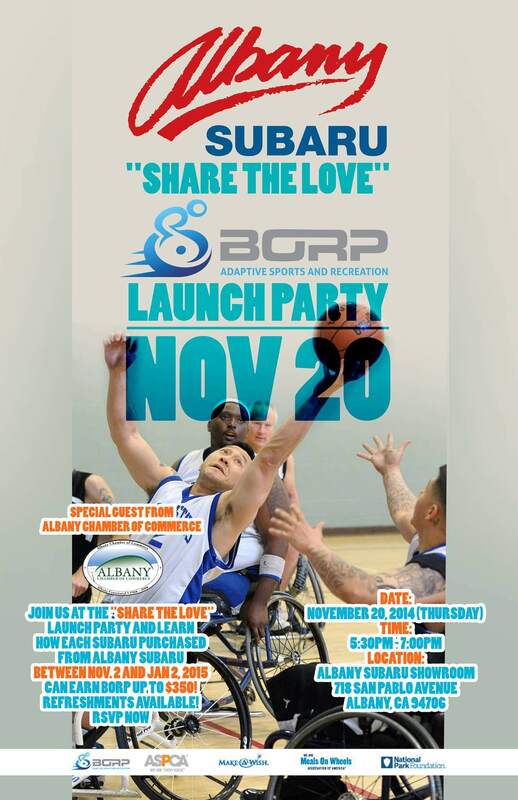 To learn more join us at the Albany Subaru “Share the Love” BORP Adaptive Sports Launch Party and learn how each Subaru purchased from Albany Subaru between Nov. 2 and Jan 2, 2015 can earn BORP up to $350! Refreshments available! RSVP now!